Just like many in NYC, I came here full of motivation to pursue my dreams. And just like many in this city, this place grew on me with all of its uniqueness, weirdness, and beauty. But at times, I can’t help but feel homesick. Sometimes, I just crave my country’s nature, my country’s people, and mostly, my country’s food! Luckily, I’ve found the cure to my homesickness, in the midst of the concrete jungle. Yara is a new Lebanese restaurant that serves delicious, and most importantly, authentic Lebanese food: No fusion recipes, and no failed cuisines. Instead, Yara offers Lebanon’s real culinary experience. I went there for the first time to celebrate the restaurant’s grand opening on Friday, April 5th. I didn’t know what to expect, but after tasting many disappointing Lebanese dishes in NYC, I was just hoping that Yara would give me a taste of home. And it didn’t fail to do so: The restaurant’s elegance and coziness charmed me: The oriental mosaic wall art was beautifully lit by dimmed lights. The contrasting brick walls and chimineas gave a comforting warmth to the décor. The huge cubic chandelier dazzled both of the restaurant’s levels with its luster. It just perfectly transmitted a modern version of the Lebanese conviviality and intimacy. The restaurant was filled with happy people: Many were sipping from their fancy drinks. Others were taking pictures at the photobooth. 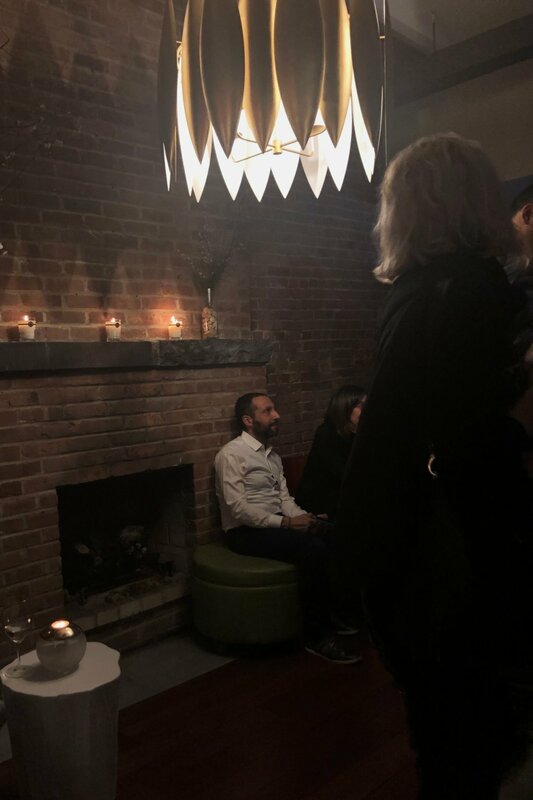 Some were ordering drinks from the beautifully-designed bar, while others were dipping (THE REAL) pita bread into a delicious hummus and muhammara (walnuts and pepper dip). 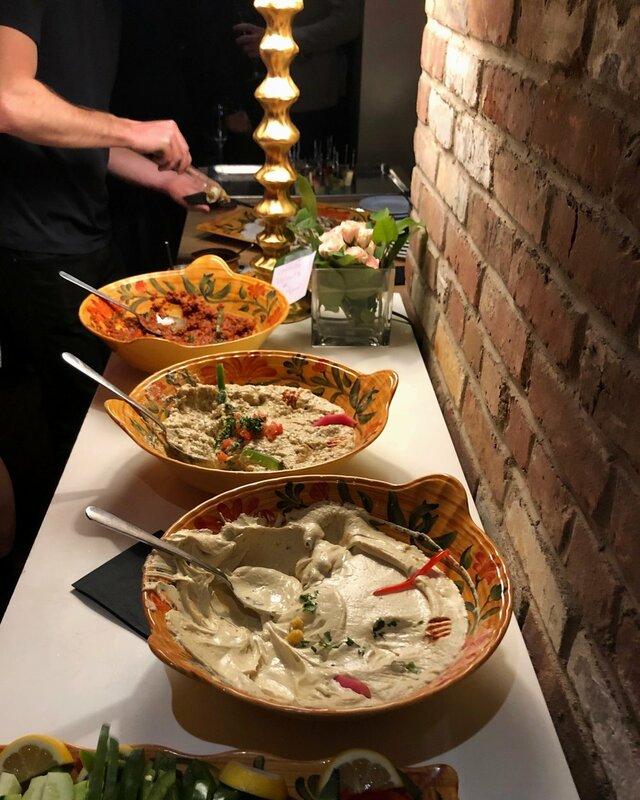 Everyone was enjoying their time, as waiters walked between guests, holding plates with bite-sized Lebanese food, that looked so appetizing and tasted even better! The thing with Lebanese food is that it’s healthy, delicious, and pleases different diets: the vegan, the vegetarian, and the meat lover. And Yara has it all. 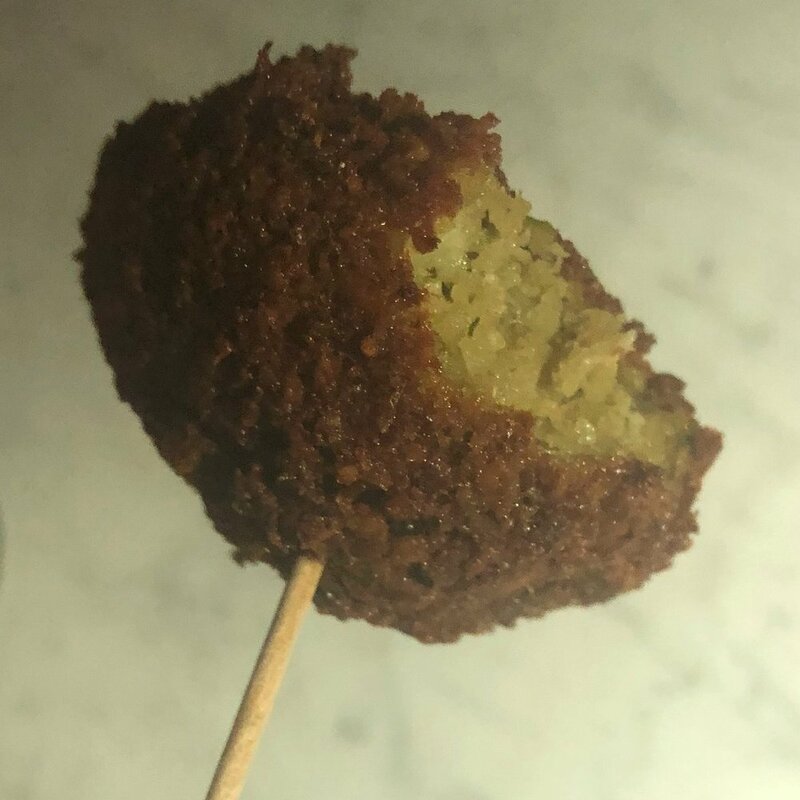 On their opening night, they served triangle spinach pies, squared pastry filled with meat and pines, Kibbeh (dumplings made with bulgur, ground meat, pine nuts, and onions), white cheese pastry with herbs, big rounded Falafel (done the right way) and of course, grilled Kebabs. Served the traditional way (in skewers), the meat dishes were varied: Chicken, lamb meat, and Kofta (meat mixed with minced parsley, onions, and herbs). I truly LOVED every bite of everything I tasted. Even Yara’s signature cocktails reminded me of my homeland’s nature: The Honey Sour’s smoothness with its sweet aftertaste aroma, and the Easy Street’s freshness with its fusion of alcohol, cucumber, and ginger. For a minute, all of these tastes made me forget that I was in New York City. These flavors from home truly made me feel like I was having dinner with friends in Lebanon-and I’m not exaggerating. I have finally found the conviviality and warmth of home, in the heart Manhattan. That night, I was cured from my homesickness, and now I finally know where to go to when I am craving a taste of Lebanon.